TORONTO – At a time when political invective has reached new lows with the media complicit in its extremes, “Hyde Park On Hudson” tells of a time when politics and the press were handled with the greatest subtlety even though the stakes were even higher. With World War II imminent in June 1939, US President Franklin Delano Roosevelt invited the king of England to a picnic where he would for the first time be photographed eating a hot dog in a masterpiece of what now would be called spin. 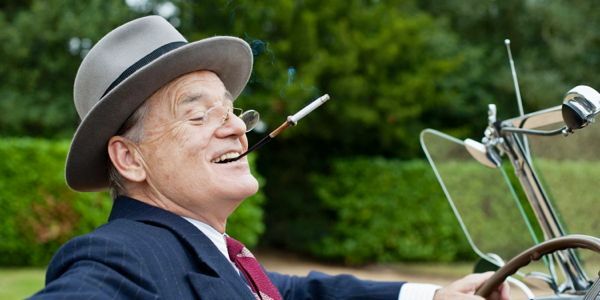 Director Roger Michell with good reason relies on Bill Murray as FDR to show the president’s sly satisfaction over a very slick piece of media manipulation the importance of which historians say should not be understated. But despite Murray’s ability, the film does just that. Michell (“Notting Hill”, “Venus”) relates the events of the stay, which followed a formal state affair in Washington, with a script by Richard Nelson, based on his stage play. It adds to the political backdrop the story of one of FDR’s mistresses, a very distant cousin named Daisy, played by Laura Linney. The love story, however, is muted and the film underplays the significance of the diplomatic coup so that there is not what you’d call an emotional pay-off for the audience. The setting of the title is the home of FDR’s mother near the town of Hyde Park on the Hudson River in rural New York State just north of Poughkeepsie. During the first ever state visit of a British monarch to the United States, King George VI and Queen Elizabeth spent five days there in early June 1939. Worldwide tension was high and on Sept. 1 Hitler’s troops would invade Poland and cause Britain and France to declare war on Germany two days later. FDR already had risked impeachment with unsanctioned support for England and he knew that for the US to respond willingly to the Nazi threat would require a more benign view of Britain than currently existed. To depict the king as a fellow who enjoyed a hot dog just like a regular American made a huge impression. There was a lot of domestic intrigue at Hyde Park as FDR’s mother (Elizabeth Wilson) attempted to run the show while his wife Eleanor (Olivia Williams) placed spanners in the works with great finesse. FDR was in charge, however, and the film depicts the guileful sway he had over everyone around him, including the press. Photographers never raised their cameras when his assistant carried him from lawn chair to desk or followed when he drove off with the king to a swimming pool. With landscapes and Simon Bowles’s evocative sets bathed in a nostalgic glow by cinematographer Lol Crawley, the film is very enjoyable with nuanced performances from its cast and Jeremy Sams’s music and Dinah Collins’s costumes are wisely understated. As FDR, Murray gives a very savvy performance with just a hint of the man’s vocal cadence, a firm grip on his cigarette holder, and shrewd indications of his brilliant mind and taste for mischief, but also the arrogance born of privilege. Linney renders a typically intelligent portrait of a humble woman beguiled by a powerful man’s charm and her gradual recognition of the true state of affairs is delicate but affecting. Samuel West plays King George VI with the personal tics familiar from Colin Firth’s Oscar-winning portrayal in “The King’s Speech”. Like Firth, he is fuller-faced than George was in fact but it makes him a more likable figure, and West puts across very well the reluctant monarch’s gradual appreciation of his role and response to the fatherly inspiration of FDR. Olivia Colman makes his queen more of a snob but one who can see through her own pretensions while Olivia Williams delivers a smashing take on Eleanor Roosevelt, brisk and clever and nobody’s fool. Cast: Bill Murray, Laura Linney, Samuel West, Olivia Colman, Elizabeth Marvel, Elizabeth Wilson, Olivia Williams, Eleanor Bron; Director: Roger Michell; Screenwriter: Richard Nelson, based on his radio play; Producers: Kevin Loader, Roger Michell, David Aukin; Director of photography: Lol Crawley; Production designer: Simon Bowles; Music: Jeremy Sams; Costume designer: Dinah Collin; Editor: Nicolas Gaster; Production: Focus Features, Film Four, Free Range Films, Daybreak Pictures; 95 mins. Rated: UK: TBA / US: R.
This entry was posted in Film, Reviews, TIFF Toronto International Film Festival and tagged 'Hyde Park On Hudson', Bill Murray, Franklin Delano Roosevelt, Laura Linney, London Film Festival, Roger Michell, Toronto International Film Festival. Bookmark the permalink.